In the run-up to the 2017-8 elections, the Royal Government of Cambodia (“RGC”) is narrowing the space for political dissent and suppressing the right to freedom of assembly. Amid the crackdown on fundamental freedoms, CCHR pays a visit to rights advocates who are being held in pre-trial detention on charges widely believed to be politically motivated. How did they get there, and what does it feel like to be held behind bars? Dressed in black and holding placards above their heads, a group of activists from Boeung Kak Lake march from house to house, reminding residents of the detention of their long-time community leader and advocate, Ms. Tep Vanny. The demonstrators are ordinary Cambodian men and women who were propelled into a land dispute when their land was leased by the government to Chinese company Shukaku Inc. for development. They hold photographs of Tep Vanny and wear t-shirts emblazoned with her face alongside the message: ‘Free the Activist’. Their march is a tribute to a human rights advocate in prison, who can no longer march for the community herself. Ominously, and despite the fact that the protest is peaceful and takes place in their own neighborhood, the demonstrators are trailed by Daun Penh security guards. The Black Monday protests go back to May 2016, when four officers from the Cambodian Human Rights and Development Association (ADHOC), as well as a former ADHOC official and deputy secretary-general of the NEC, were arrested on charges of bribing a witness. Mr. Ny Sokha, Mr. Yi Soksan, Mr. Nay Vanda, Ms. Lim Mony and Mr. Ny Chakrya had given advice and legitimate reimbursement of food and transport costs to Ms. Khom Chandaraty, who sought their legal assistance after police named her as one of the people featured in recorded phone conversations with acting leader of the CNRP, Kem Sokha. Protesters from eviction-hit communities such as Boeung Kak Lake and Borei Keila expanded the ongoing campaigns to demand the release of the four ADHOC staff and one NEC member, dubbed the ‘5KH’. Drawing together disparate social movements, local activists and civil society organizations began to support each other through these demonstrations. Various groups began wearing the color black to demand the release of the five. The color not only showed support for the protesters, it was a mark of the political suppression they faced. They gathered in central Phnom Penh to demonstrate opposition to the continuing pre-trial detention of the five, often brushing up against the authorities. After the death of political analyst Kem Ley in July, they further expanded the scope of the protest and demanded an independent investigation into the death. But as the activists entered the public debate on the 5KH, they too became targets of judicial harassment. Black Monday protestors were arrested and detained. Some were forced to sign documents with the promise that they would no longer gather in public wearing black – a measure which has no basis in domestic law. They were told to obtain permission from the Ministry of Interior before launching campaigns. The government warned protesters that their actions were being recorded and they could be targeted by the authorities retroactively. Threatening phone calls and personal visits were made by security forces to prominent activists. All of these actions violate the International Covenant on Civil and Political Rights, a treaty to which Cambodia is a party. Dozens of arrests have been made in relation to the Black Monday campaign, and on 16 August 2016 two of its most prominent leaders – Tep Vanny and Bov Sophea – were detained and charged with incitement. Incredibly, when it came to the trial the judge altered the charges against them during the delivery of the verdict and in the end both were convicted for insulting a public official. In a move that has been seen as a politically motivated response to the prominence of Black Monday protesters, Ms. Tep Vanny was kept in pre-trial detention in relation to previously dormant charges of intentional violence, relating to a 2013 protest outside Prime Minister Hun Sen’s house, an occasion which ended in a violent crackdown on the demonstrators by security guards and para police that left some with broken bones. Now the 5KH have been detained for over 300 days, and Ms. Tep Vanny for over 200. Their charges bear all the hallmarks of being politically motivated. In November 2016, the UN Working Group on Arbitrary Detention ruled the detention of the ADHOC 5 ‘arbitrary’, and on 23 February 2017 four of the five were denied bail by the Court of Appeal. On 13 March 2017 the Supreme Court also rejected a challenge by four of the five detainees to the extension of their pre-trial detention; the Supreme Court will hear Ny Chakrya’s challenge to the extension of his detention on 24 March. The Cambodian Centre for Human Rights (“CCHR”) conducts regular prison visits to touch base with the detained human rights defenders and assess their needs. At Prey Sar prison the ADHOC 5 and Tep Vanny live with hundreds of prisoners, both those awaiting trial and those who have been convicted of crimes. With overcrowded conditions and everything from toiletries to the water to wash with costing money, Prey Sar is a difficult environment to live in. It’s even harder if you are kept there without having yet been convicted. Even within the same prison, the detainees do not get many opportunities to speak to one another, and all have a lot to say to our NGO officers. The main concern shared by the human rights defenders was concern for their families. As well as missing family and friends, the detainees feel removed from their domestic situation and worry about the safety and wellbeing of their loved ones. From having to sit behind a barrier when they visit to being unable to look after them when they’re sick, the detainees feel separated from relatives who rely on their care. Some of their children are struggling with their studies or are unwell, which the detainees see as a result of the stress of having a parent in prison. Detainees are particularly worried about their families facing intimidation from the authorities. The detainees were also concerned about other human rights activists whose freedom of assembly is being suppressed. The recent case of Mr. Am Sam Ath and Mr. Chan Puthisak being summoned to court for questioning about a protest they attended last October, when they were beaten by security guards, was particularly troubling. They worry that such moves may be judicial intimidation, designed to deter other human rights defenders from taking a stand. Crowded conditions and poor hygiene are a constant battle in prison. Within the time that they have been detained, the human rights defenders have seen prisoner numbers soar, sometimes from 20 people in a cell to as many as 50. The Ministry of Interior’s annual report shows that prison numbers have jumped 20 percent since last year. The detainees report that sleeping at night is particularly hard in packed cells. Despite being held in detention indefinitely, one detainee in particular gave an emotional statement on the current state of Cambodian society. In an impassioned plea, the detainee stressed that – now more than ever – government officials, civil society members and the Cambodian community as a whole need to come together to create a better future for Cambodia. With the upcoming commune elections looming, the importance of peaceful dialogue and cooperation between all sectors of Cambodian society is integral to preserve and develop the democratic structures Cambodia has in place. The prisoner closed their statement reiterating that a fire for justice still burns brightly inside of them, and that they hope Cambodia will continue to rise and grow throughout this difficult time in its history. Overall, the human rights defenders are in good spirits. This is a sign of their incredible courage and fortitude in the face of adversity, perhaps strengthened by their conviction that they do not deserve such lengthy imprisonment. One detainee expressed worry that advocacy for their cause will dwindle the longer the case is prolonged and they remain in prison. It is imperative that civil society organizations and Cambodian citizens to show their support for the 5KH and Tep Vanny. To find out more about the #Freethe5KH and #FreeTepVanny campaigns, and to send the detainees a personal message in prison, visit https://freethe5kh.net. Indigenous people in Cambodia face an uphill battle to protect their communal lands. Powerful economic interests are gaining ground, and land registration procedures are failing to shield communities from destructive development. Earlier this month, the Cambodian Center for Human Rights (“CCHR”) released a report “Access to Collective Land Titles for indigenous communities in Cambodia” on the state of the collective land registration system for indigenous communities. The report analyzes the barriers these communities face when trying to protect their land, finding that it is impossible for indigenous communities to complete the registration process themselves without outside assistance. Land in Cambodia, as in many countries, is a key foundation of society. Land rights provide not only certainty for economic development and investment, but also security for families and communities. For indigenous communities in Cambodia, who have a very close relationship to the land, formal protection for collective ownership of land exists through collective land titles (“CLTs”). This title is specifically designed to protect indigenous communities’ interests. The existence of such customized, theoretically protective laws is remarkable; Cambodia is one of the few countries in the world where such comprehensive legal protections for indigenous land rights exist. But, as is often the case in Cambodia, what appears sufficient and effective on paper is not implemented in reality. As CCHR’s report makes clear, in practice collective land registration has been almost non-existent – of Cambodia’s 458 indigenous communities, only 11 have been able to complete the process and register their collective lands. Numerous issues with the CLT registration process for indigenous communities were revealed by CCHR’s research, which explain this gap in the implementation of collective land registration. The cost, as mentioned, is very high, up to $20,000 for the first of the three stages alone. Communities require expert assistance for mapping their communal lands, and are also required to draft community bylaws. Communities can also only receive provisional protection of their land rights at the final stage of the application process. This is a major issue as the process can take years, meaning that communities have to fend of competing interests, such as companies seeking to begin logging in the area, for a protracted amount of time. In the face of these challenges, little is being done to improve the process. Recently The Cambodia Daily reported that Germany had decided not to continue its support of the Ministry of Land Management, Urban Planning and Construction (“MLMUPC”), who manage the final stage of the CLT registration process. Germany was the last of several international partners that have been assisting the Royal Government of Cambodia (“RGC”) in their land reform projects, yet despite Germany’s persistence, repeated efforts at improvements and cooperation have been rebuffed. On the repeated suggestions from Germany that the RGC create an independent land dispute resolution body, the German Ambassador Joachim Baron von Marschall said, “Again, it seems that the government is not yet prepared to have such an institution. This was particularly signaled to us”. The RGC also, according to the Ambassador, ignored repeated calls to have government land registers made public – this was a “political decision” on the part of the RGC. The implications of this withdrawal are potentially very damaging. In the absence of such international assistance, it is likely that the delays for indigenous communities attempting to register their collective lands will increase. The attitude of the RGC, and particularly the MLMUPC, is further revealed by their comments made after the CCHR report on collective land titling was launched. The MLMUPC denied that the report’s observations were valid, claiming that the government never allows the any companies violate the land of indigenous communities. The MLMUPC also denied that they had contributed to the report, with ministry spokesperson Seng Loth commenting, “there was no participation from the ministry in providing data”. However, in stark contrast to this claim, consultation with the MLMUPC was carried out in January 2016, as is described in the report. CCHR found this consultation to be informative, and was able to use substantive information from this consultation in the report. To deny the veracity of this report, and by extension refuse to consider any recommendations within it, is tantamount to refusing to acknowledge the problem. This is a critical time for indigenous land rights in Cambodia as indigenous communities are increasingly experiencing land alienation throughout the country. When indigenous communities lose their lands, they not only lose their livelihoods, but also risk permanently losing their indigenous culture and identity. It is hoped that the CCHR report, including its recommendations to relevant stakeholders, might serve to improve the implementation of the CLT registration process. The human rights, dignity and irreplaceable heritage of indigenous communities are at stake. If this is not motivation enough for the RGC to change its approach and make a concrete commitment to indigenous land rights, it is also notable that land rights issues are a significant cause of protests throughout Cambodia. To resolve land disputes and create effective land rights protection would lead to a more peaceful, equitable Cambodia for all citizens. Khmer New Year is traditionally a time to reflect on the year that was, and look forward to what the future will bring. This year’s festivities began on a positive note, with the release of imprisoned land rights activists and opposition party members. However, while certainly cause for celebration, the significance of the move should not be over-stated: the releases are reportedly the result of political bargaining between the CNRP and ruling Cambodian People’s Party, following months of negotiations related to the reform of the National Election Committee. Without meaningful reform to strengthen judicial independence, politically motivated cases against critical voices and unfair trials are likely to continue. In every facet of society, women across the world continue to possess fewer advantages while enduring greater threats to their safety and well-being. The abuse of women’s rights is considered by some as the concern of women, and women alone. This is not a ‘women’s issue’, it is a human rights issue. 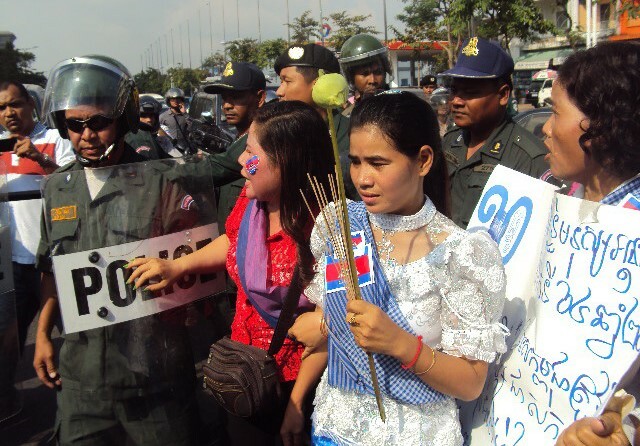 In Cambodia, the simple act of a woman speaking out can be seen as defiant and abhorrent. Nevertheless, brave female activists are raising their voices amidst ongoing attempts from the authorities to silence them. As people held flash-mobs to raise awareness of women’s rights ahead of International Women’s Day, events planned by civil society groups to encourage and empower women in prison had to be cancelled due to new restrictions. Ly Siev Minh has lived here for as long as she can remember. It may not be perfect, but it’s home. Her father loves it here, he would fight for her family’s right to be here, no matter what. Minh lives in Phnom Penh, on a piece of land a company has decided it wants to build on, land it views as more valuable than her family. This means her father has had to fight for her family’s right to be here. He has fought hard, and long, and she is proud to have fought by his side. Guards hired by the company have put snakes in her house, her drinking water has been poisoned, she has been pushed to the ground by the company’s guards, cut by them, and watched her father be beaten by them. Finally, her father was arrested, and when she searched for him, they arrested her too. She is still in prison. Today, 10 December, marks International Human Rights Day (“IHRD”). Proclaimed by the UN General Assembly in 1950, IHRD aims to bring the world’s attention to the Universal Declaration of Human Rights (“UDHR”) as “the common standard of achievement for all peoples and all nations.” However, despite the dramatic improvement in Cambodia’s human rights situation since the Khmer Rouge atrocities of the 1970s, human rights violations remain a serious problem in Cambodian society, with those from poor and marginalized communities particularly affected. IHRD is an important moment for the human rights community in Cambodia to raise their concerns, and over the last few days human rights defenders (“HRDs”), monks, activists and civil society groups marched from across the country to Phnom Penh. They gathered outside the National Assembly this morning to call for, among other things, improved labour rights, land rights, and the release of imprisoned fellow activists. In early September 2014, it was declared that the White Building, home to approximately 2,500 inhabitants, would be demolished as it is structurally unsound and a threat to its inhabitants. The building was created in 1963 by the then Prince Norodom Sihanouk to provide low-cost housing for Phnom Penh’s growing population, and was a symbol of social security. Today its residents are faced by substantial insecurities and potentially forced evictions. The White Building was designed by architects Lu Ban Hap and Vladimir Bodiansky, and has a total of 468 apartments. It is considered a prime example of the New Khmer architectural movement, which was underpinned by the famous architect Vann Molyvann. Molyvann is well-known for many notable structures, including the Independence Monument, the Council of Ministers, and the State Palace. Hang Chenda at a recent training workshop. Hang Chenda has spent her life fighting for justice for those who have been unfairly evicted from their land and to end the environmental damage that accompanies it. Chenda grew up in Ouorknha Heng commune, Prey Nub district, in Preah Sihanouk province. She lived with her father, an Officer at the Department of Public Works and Transportation, and her mother, a housewife, along with two brothers and four sisters. In 1980, she commenced her study in “Pum Kampenh”, a primary school in Preah Sihanouk province. However, given the family’s limited financial resources and her many siblings, Chenda ceased studying after fifth grade. Today, she has two children, and continues to reside in Preah Sihanouk province. On the 24th of June representatives from CCHR attended the press conference held by Professor Surya P. Subedi, the United Nations (UN) Special Rapporteur on the situation of human rights in Cambodia, at the end of his most recent visit to Cambodia. As a United Nations Special Rapporteur, his role is to visit Cambodia twice a year to investigate the current human rights situation, and then report back to the UN Human Rights Council on his findings. 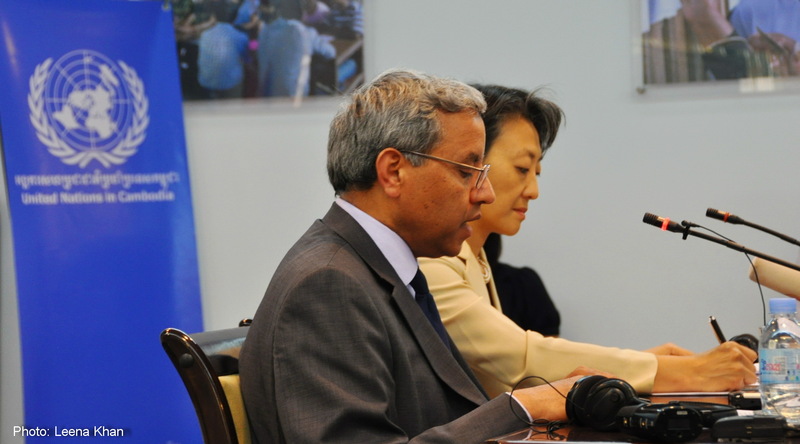 Even though he is described as the “United Nations” Special Rapporteur, Professor Subedi is not employed by the UN, the idea being that he is able to offer an independent assessment and perspective as a result of his visits. The press conference was an initial summary of the result of his visit (full statement here in English and Khmer) and Professor Subedi will present a formal report to the UN in September. This was his 11th visit to the country in this role, so he was able to talk broadly about the human rights situation in Cambodia. Some of it was positive, but for the most part he was very concerned with what he found. Professor Subedi covered a broad range of human rights issues, from land and labor rights to access to democratic spaces, to reform of the judiciary, constitution, electoral and parliamentary frameworks, and other governance institutions.